With the help of countless, dedicated volunteers, Ride New Orleans surveyed 1,575 ferry riders. The survey results reveal that the loss of the Algiers-Canal Street ferry would have major economic impacts on the New Orleans region. “Without the ferry I would be a virtual prisoner, unable to leave Algiers Point without paying a hefty taxi fee or adding a lot of extra travel time to my commute,” says ferry rider and West Bank resident Kate Stiteler. “I work in the service industry. I’m a corporate training manager for a luxury hotel and could not do my job or share my skills with my hospitality team without the ferry.” Unfortunately, for Kate and the 1.3 million ferry riders who utilize the Algiers-Canal Street ferry annually, the Louisiana Department of Transportation and Development (LA DOTD) will cease to fund the ferry in June 2013 threatening continued service, unless a change is enacted. The survey reveals a great deal about who rides the ferry each day and the role it plays in sustaining our local economy. More than half of ferry riders use the Algiers-Canal Street ferry in order to travel to and from work. In contrast, only 37% of the ferry riders we surveyed were riding for a tourist experience. The survey results show that of the riders using the ferry to get to work, almost half are employed in the hospitality and tourism industry and more than 80% live in West Bank neighborhoods ranging from Algiers Point to Terrytown and Gretna. Of the riders who use the ferry to travel to work, 38% do not have access to a personal vehicle. This means that a significant number of workers in the hospitality, tourism, and other industries would be affected by the loss of ferry service. More than half of the ferry riders said they would either have a very difficult time accessing their job or would be unable to get to work if the ferry service is cut. 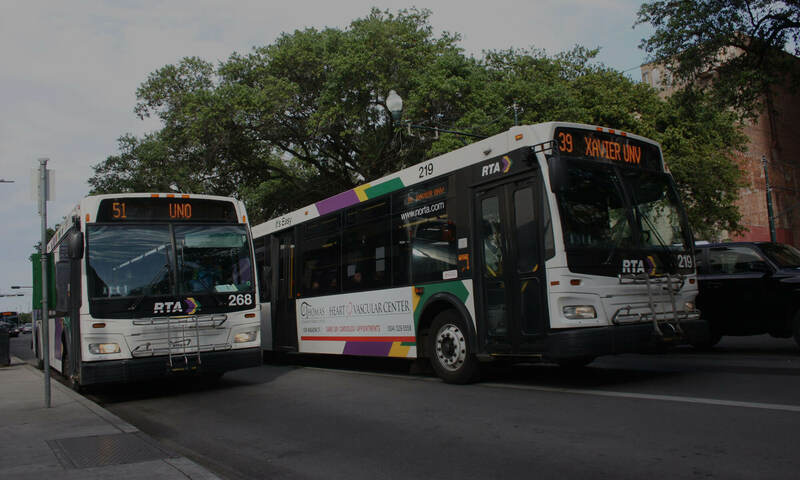 While the Regional Transit Authority (RTA) does provide bus service across the river from Old Algiers into the heart of Downtown by way of the Crescent City Connection, many riders making this trip from various parts of Algiers and other West Bank communities would be required to transfer between a bus and a streetcar and would only have access to two buses travelling across the river after 10:00 pm – making for a long and difficult commute. In contrast, the Algiers-Canal Street ferry offers five-minute trips across the river every 30 minutes until 1 am each day. The survey also shows that 20% of ferry riders travel with their bikes in order to make quick and easy connections to their destinations. According to the U.S. Census American Community Survey released in 2011, the median housing price of the West Bank neighborhoods closest to the ferry terminal are more affordable than nearby East Bank neighborhoods – even those outside of the popular French Quarter and Central Business District – by a difference of more than $100,000. As a result, housing prices make the West Bank an attractive place to live for many middle and low-income families and for many hospitality and tourism industry workers who may have limited housing options otherwise. 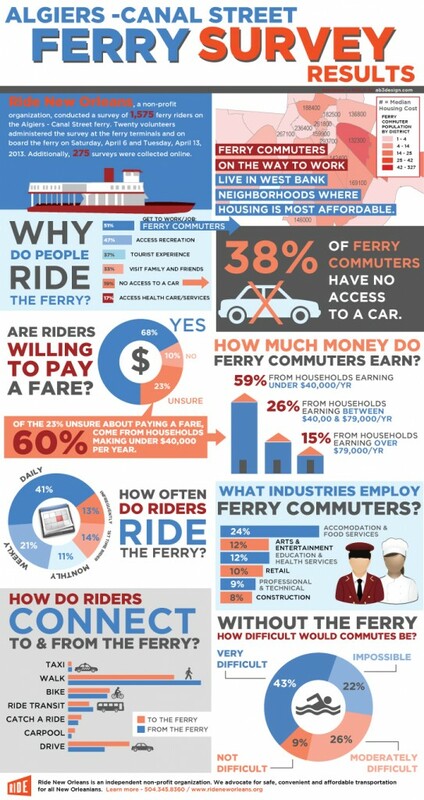 Though many ferry riders have limited income, 68% indicated that they would be willing to pay a fare. Currently, only passengers bringing a vehicle on the Algiers-Canal Street ferry pay a fare of $1.00. Introducing a fare has significant potential to raise revenues to support continued ferry operations. A fare of $1.25 for all ferry riders – consistent with RTA’s bus and streetcar fares – could generate $1.6 million annually. That amount could cover close to half of the $4 million cost of operating and maintaining the Algiers-Canal Street ferry. The Algiers-Canal Street ferry is in crisis due to an action in 2012 by the State legislature which voted to separate the ferries from their former funding source, the Crescent City Connection bridge tolls. As the fate of bridge tolls was under debate, the State legislature prohibited any future bridge tolls from funding the ferries – even if approved by voters. The law subsequently did not provide alternative funding sources or mechanisms to maintain ferry service. Thus, the future of the Algiers-Canal Street ferry service is in the hands of the State Legislature whose current legislative session is underway. Let’s hope that our legislators act quickly to find funding for the Algiers-Canal Street ferry. If they don’t, more than 1,500 jobs could be jeopardized by stripping workers of their basic means to get to work.